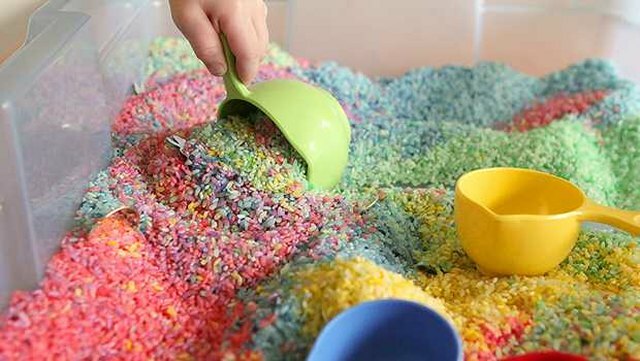 Many parents take one look at a sensory box and are instantly scared off by the potential mess. Which is really too bad considering the astounding chunks of time children will spend engrossed in playing with them as it engages nearly all of the senses (tasting is not recommended!). All sensory boxes center around touch and sound, but this particular version also has vibrant colors and even a unique smell. Follow the steps below to make your own, but be prepared – your kids will likely be so into their new toy that you’ll find yourself with an hour or more of unexpected free time. 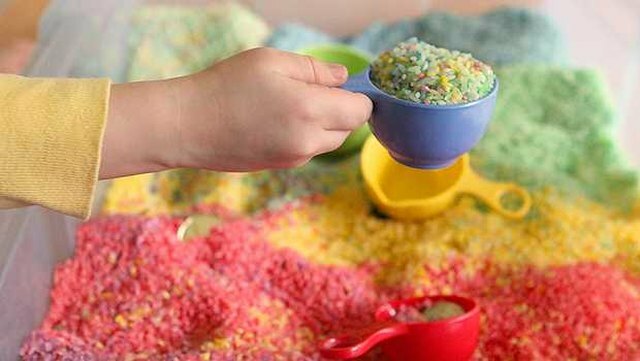 A towel placed directly under your sensory box makes for easy, one-step clean up when the fun is over. 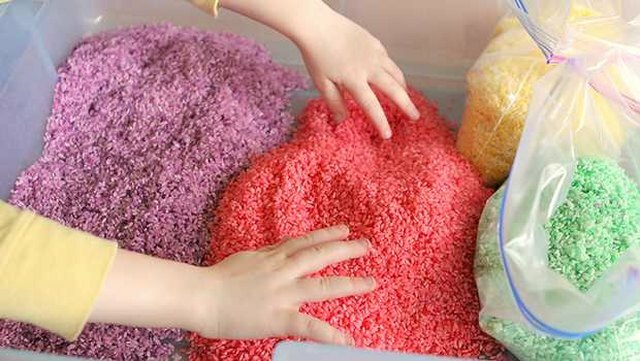 Decide how many different shades of rice you’d like to include in your sensory box and set aside that number of plastic bags. 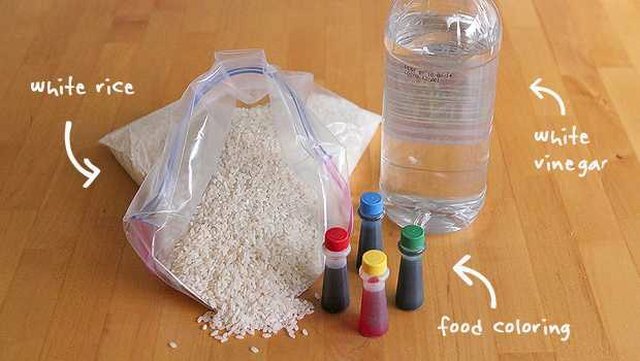 Next fill each bag with 5 cups of rice as well as 2 – 3 tablespoons of vinegar and around 30 – 40 drops of food coloring (more for darker colors). Seal the bag and mix and shake until the colors are evenly distributed. Next, open the bags and allow them to air out overnight. This will dramatically reduce the vinegar smell from strong and overbearing to subtle. The rice colors will all get mixed together eventually but kids love an initial rainbow presentation. 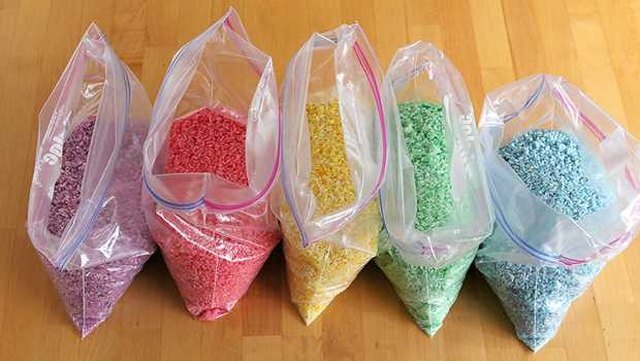 To pull this off, line up the bags of rice in the color order of your choice inside your container. Then pour out each bag one-by-one, taking care not to mix them. We like to use the bags we haven’t poured yet as a temporary wall to keep the rice from sliding around. 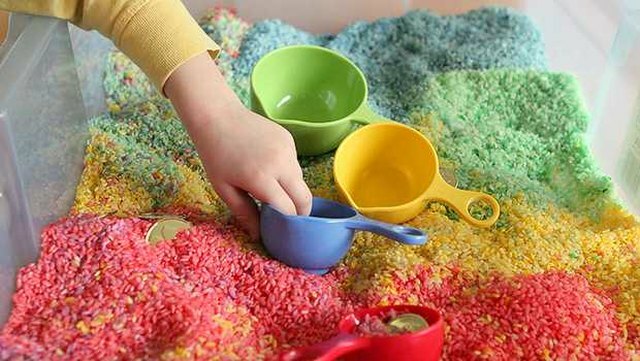 Play options with sensory boxes are limitless. 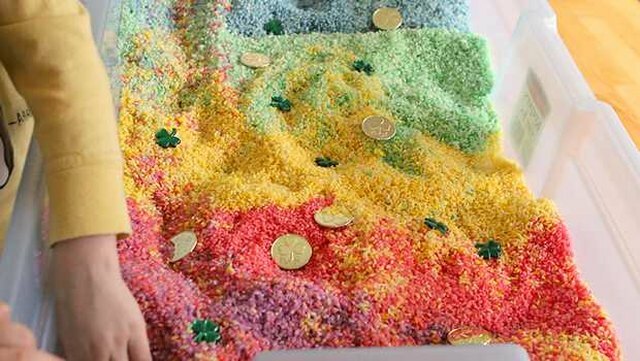 For this project, we decided to hide some clovers and Leprechaun gold in homemade rainbow. And no sensory box would be complete without lots of good tools for scooping and pouring. The best part of this box is getting to see the gorgeous patterns that emerge as the colors mix and merge. After about 20 minutes your box will look like a big, happy box of confetti. 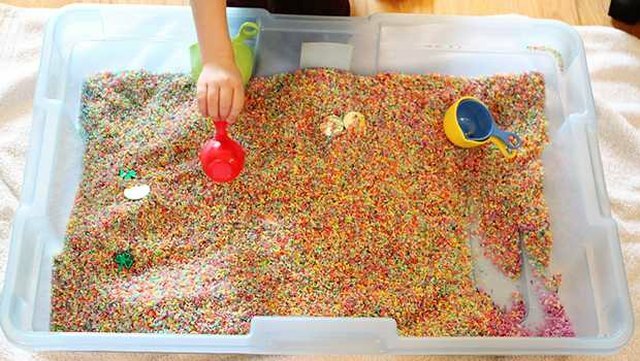 Once the kids are done playing, simply pop the lid on your container and stow it away for a rainy day.